Buddy and I traveled to see Lamani Lin, a beautiful Huckins 44' Atlantic that launched in 2000. Our visit was a bittersweet one because this special yacht was originally built for a dear friend of ours, Tom Purcellâ€”a man I liked to call Buddy's twin brother from another mother. Tom was diagnosed with cancer before he decided to build a boat with us and told us he might only have a short time to enjoy her. "I'm in a situation where I have an extensive life list," he admitted to Buddy, "but now I need to shorten it." It's an honor to know that one of the last requests he made while he was still alive was to experience building a Huckins with Buddy and me. I was looking for a three-foot or less draft boat and I came upon an ad that featured a Huckins 44', anchored under trees, right next to the shoreline. Tom would have been happy to know that shortly after his passing, Lamani Lin was bought by enthusiastic new owner, Joe Mondelli, who fondly recalls seeing the Huckins ad that sparked his interest and planted the seed for his eventual purchase. 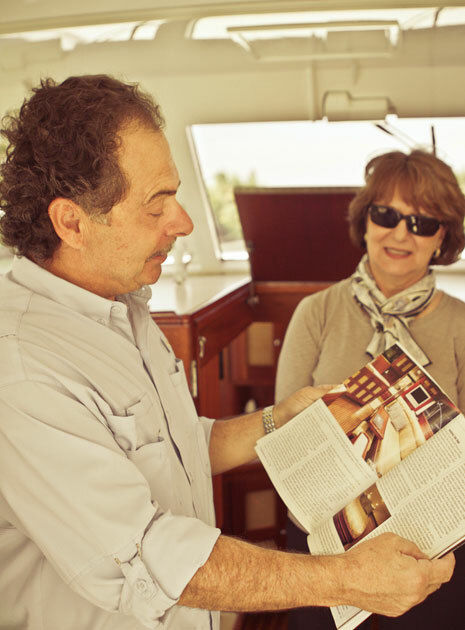 "I was skimming through an issue of Yachting magazine when I came across a Huckins ad," he told us. 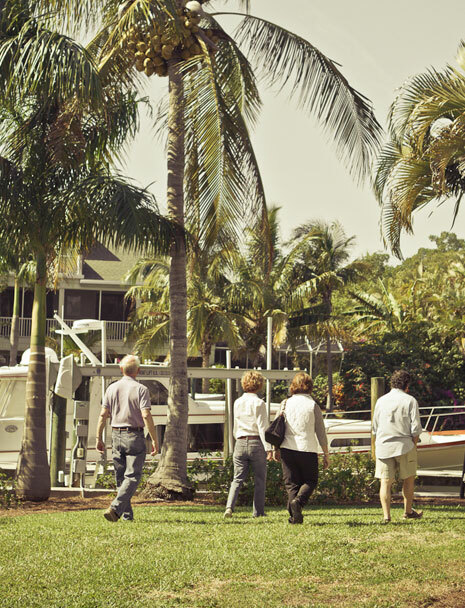 "I was looking for a three-foot or less draft boat and I came upon an ad that featured a Huckins 44', anchored under trees, right next to the shoreline. I thought, that's got to be a shallow draft boat, but I need to check to make sure." Joe picked up the phone and got the answer he was looking for when we reassured him that all of our 44s feature a draft that is three feet or less. During this conversation, Joe learned that the Huckins Quadraconic hull is designed to handle a lightweight cargo and shallow draft, and that the efficiency of the hull allows less horsepower to reach the same speeds of other yachts of similar size. Each of these features appealed to Joe and his wife, Linda. Joe purchased Tom Purcell's 44' Huckins Atlantic in 2006 and worked closely with the Huckins team to reconfigure the interior to suit his and Linda's needs. Linda was in charge of renaming the boat. She wanted to incorporate the names of her three daughters, so she decided to combine the first two letters of each girl's name—Lauren, Mara, Nina—with the first three letters of her own name, which resulted in Lamani Lin. Full details on the reconfiguration of the Mondelli's Huckins are coming up next.